Understanding how our genes are organized in the cell nucleus and how they move in space and time is one of the most exciting and challenging research areas in biology. To unveil the secrets of gene behaviour it is necessary to develop tools to visualize genes in living cells. We have recently developed “PoSTAC”, a gene visualization tool to image multiple genes at the same time with high efficiency. Using PoSTAC we could track gene movements with high temporal resolution and visualize them with super-resolution microscopy. We reached ten times greater spatial resolution than with conventional imaging methods. PoSTAC is a flexible tool that can be applied to a wide variety of cell types and genes. These technological improvements are key to reveal how genes work in our cells and to dissect at a molecular level how genes get organized during key biological processes and in disease conditions. 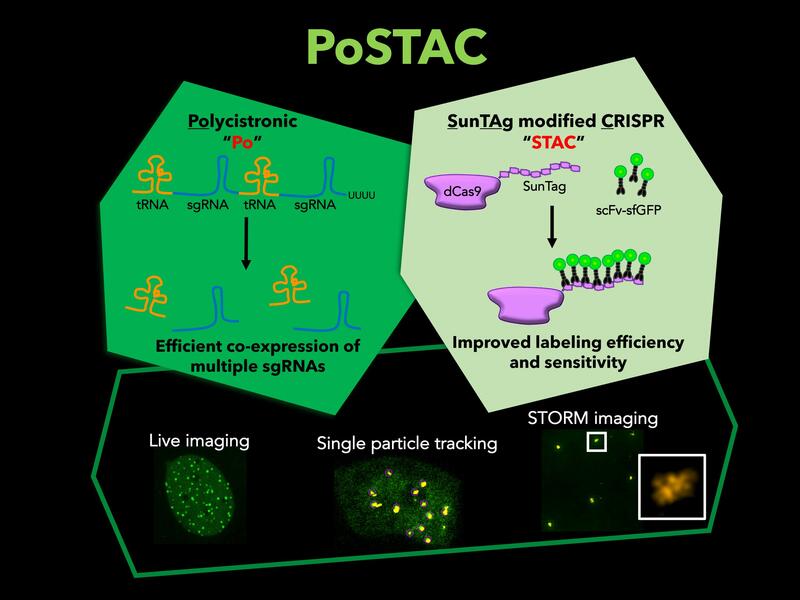 Neguembor MV, Sebastian-Perez R, Aulicino F, Gomez-Garcia PA, *Cosma MP & *Lakadamyali M 2018, '(Po)STAC (Polycistronic SunTAg modified CRISPR) enables live-cell and fixed-cell super-resolution imaging of multiple genes', Nucleic Acids Research, 46, 5, e30. *co-corresponding authors. New work by the research teams led by Gustavo Deco, ICREA research professor and director of the Center for Brain and Cognition, UPF, and Morten Kringelbach, University of Oxford and Aarhus, published on 27 September 2018 in the journal Current Biology may mean a breakthrough for the treatment of neuropsychiatric diseases. A new method to model neuroimaging data could help to predict potential treatment outcomes for patients with mental health disorders. The study by researchers from ICREA/Pompeu Fabra University, and the University of Oxford looked specifically at people with mental disorders attributable to diseases of the nervous system such as depression and addiction. The team used neuroimaging data of healthy participants who had been given LSD (lysergic acid diethylamide) and placebo treatments to prove the concept of the new computer model. They used an advanced computer model of human neuroimaging data that precisely modelled whole-brain dynamics using the actual brain connectivity between regions. For the first time, this whole-brain model of neural activity was integrated with the concentrations of the chemical messenger – a serotoninergic neurotransmitter- called 5HT2A, in each brain region. Integrating this information in the model allowed the team to investigate the causal non-linear interactions between neural activity and neurotransmitter concentration. As the concentration of neurotransmitter changes in one or more regions so thus the brain dynamics, but crucially in a non-linear way that requires a model to predict. An advanced computational model that is able to simulate precisely the dynamics of the entire brain, using real brain connectivity between different brain regions. 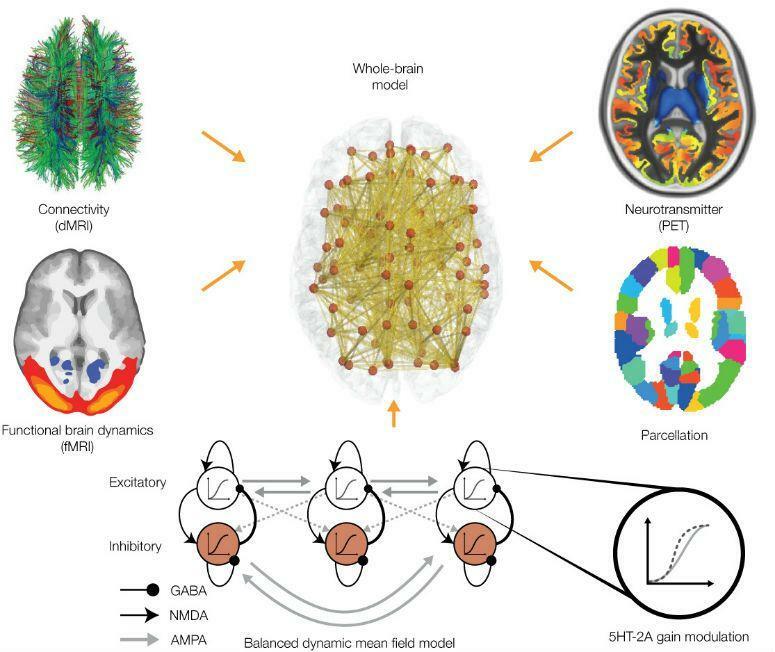 Deco G, Cruzat J, Cabral J, Knudsen GM, Carhart-Harris RL, Whybrow PC, Logothetis NK, Kringelbach ML 2018, 'Whole-Brain Multimodal Neuroimaging Model Using Serotonin Receptor Maps Explains Non-linear Functional Effects of LSD', Current Biology, 28(19):3065-3074. ICREA scientists at the Centre for Genomic Regulation in Barcelona, Spain, have uncovered the role of special chemical ‘tags’ in controlling vital genes involved in early mammalian development. Led by L Di Croce and MA. Marti-Renom, the study focused on a set of genes with what’s known as bivalent promoters – two-way genetic ‘control switches’ that are poised either to turn on in early development and rapidly drive high levels of gene activity, or to switch off and shut down the gene completely. These genes play essential roles in early development where cells have to make quick decisions about which fate to adopt, so the poised switches allow them to quickly flip into the correct pattern of gene activity. Previous work had already shown that there are opposing types of chemical ‘tags’, known as histone modifications, that are present on these two-way switches – one set is associated with gene activation and the other with gene silencing. The active tags are put in place by a molecule called MLL2, while the silencing marks are put on by Polycomb proteins. To find out more about the interplay between the two type of histone modifications on the switches, they studied mouse embryonic stem cells growing in the lab. These cells are capable of changing into all the different tissues in the body, and genes with bivalent switches play a key role in setting them off on the right developmental pathway. The researchers used genetic engineering techniques to remove MLL2 from embryonic stem cells, removing all the activating histone modifications from the bivalent gene switches and leaving only the silencing tags and associated Polycomb proteins. They found that these modified cells were no longer able to grow into embryoid bodies, and that many important developmental genes weren’t activated when they should have been. Not only do the team’s findings shed light on the earliest points in development when cells are quickly making decisions about what to do in order to build an embryo, there are also implications for understanding what might have gone wrong when development fails or in diseases involving disrupted gene activity, including cancer. By integrating several "Next-generation sequencing” technologies, the Marti-Renom and Di Croce research groups unveiled the role of MLL2 in the organisation of 3D genome and in the differentiation of mouse embryonic stem cells. 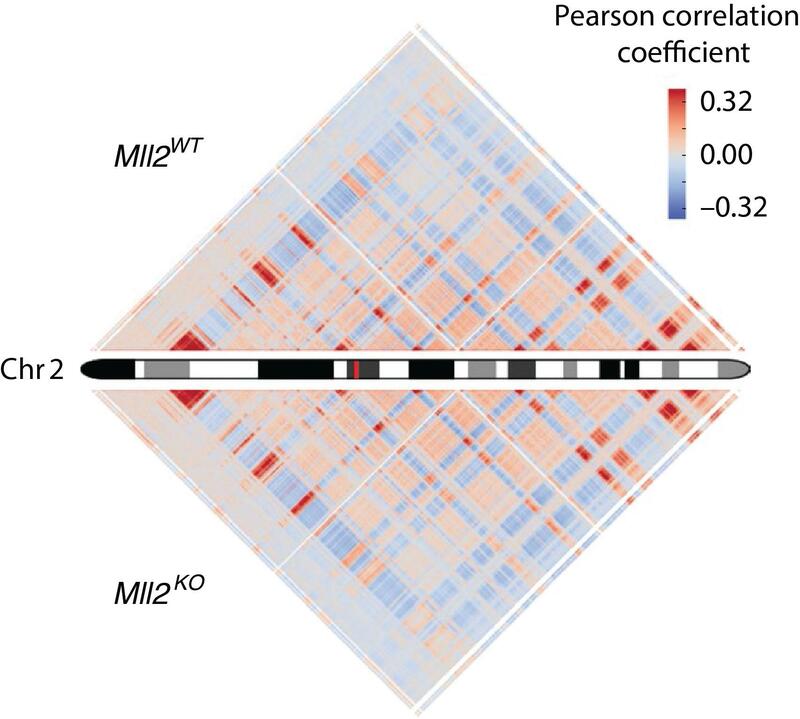 The images highlights changes in chromatin architecture of chromosome 2 for MLL2 wild-type and knock-out embryonic stem cells. Mas G, Blanco E, Ballaré C, Sansó M, Spill YG, Hu D, Aoi Y, Le Dily F, Shilatifard A, Marti-Renom MA & Di Croce L 2018, 'Promoter bivalency favors an open chromatin architecture in embryonic stem cells', Nat Genet., 50, 1452-1462. Our Universe might be on the edge of destruction, as theory suggests that the Higgs field is in a metastable vacuum. If this field tunneled to its “true” minimum energy state, the release of energy would be cataclysmic. The danger may be over-stated, as other physical mechanisms could have kept the Universe stable throughout its history. 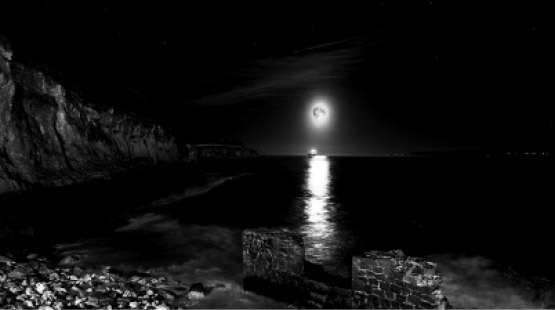 Nevertheless, the Higgs instability could have a major cosmological impact as the source of dark matter. According to this new scenario, dark matter consists of a large population of subatomic-size black holes that formed from fluctuations in the Higgs field probing the potential instability at the dawn of the Universe. These so-called primordial black holes have been proposed before, but this is the first hypothesis that doesn’t require physics beyond the standard model (apart from a period of inflation). Physicists have long been aware that the Universe might rest in a “false vacuum.” This idea has recently taken on new urgency, as calculations based on the measured top and Higgs masses have shown that a lower energy state may exist for the Higgs field. Analyzing the implications of the Higgs instability, José R. Espinosa (IFAE, Barcelona), Davide Racco and Antonio Riotto (University of Geneva) have found that this menacing mechanism could be instrumental in creating the dark matter that makes galaxies and other life-accommodating structures possible. The team studied fluctuations in the Higgs field during the early inflationary expansion of the Universe. 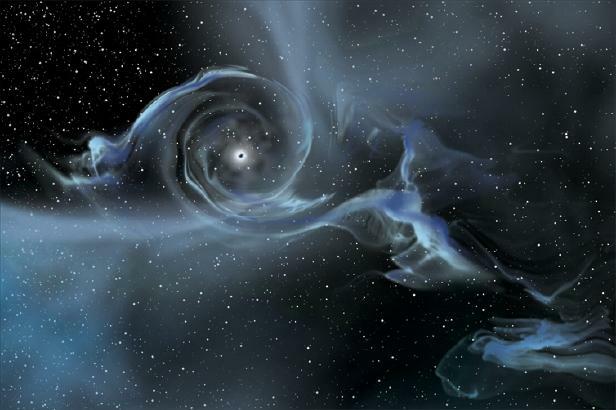 Under certain assumptions, these fluctuations become seeds for microscopic black holes with masses around 1015 kg that could have a density consistent with cosmological predictions of dark matter. If this scenario were correct, the Higgs field would not only be responsible for the masses of elementary particles but also for the dark matter content of our Universe. In red, the spectrum of primordial black holes (PBH), generated by the mechanism discussed, as a function of the PBH mass. The PBH abundance is given in units of the cold dark matter abundance: for a ratio equal to 1 the whole dark matter could consist of PBHs. The plot also shows observational constraints from different effects that would reveal the existence of black holes with the given mass and abundance. 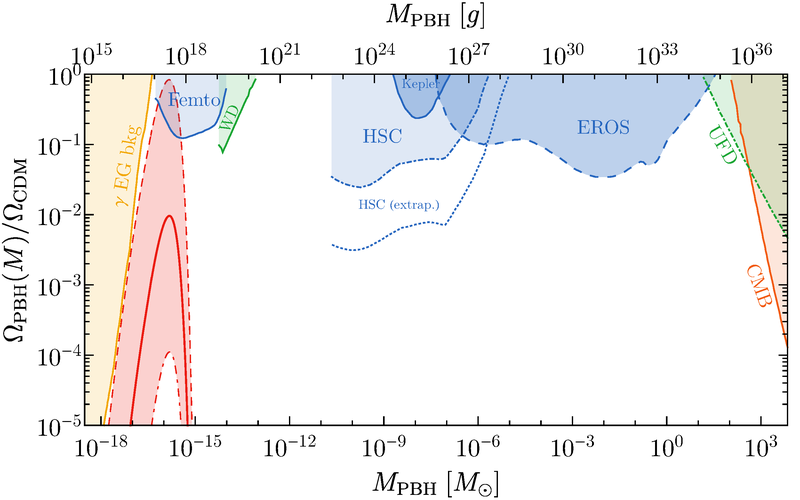 Espinosa JR, Racco D & Riotto A 2018, 'Cosmological Signature of the Standard Model Higgs Vacuum Instability: Primordial Black Holes as Dark Matter', Physical Review Letters 120, 121301. A research led by Manel Esteller discovered how an epigenomic profile predicted the clinical response to immunotherapy in lung cancer. The article, published in the journal The Lancet Respiratory Medicine, showed how a particular DNA methylation signature was associated with sensitivity to anti-PD-1 immune checkpoint inhibitors. Non-small cell lung cancer (NSCLC) is the leading cause of cancer-related death worldwide. Although immunotherapies have extended the lives of many patients with advanced disease, a substantial percentage of cancers don’t respond to this treatment strategy. Now, a new study shows that a DNA methylation profile is associated with improved progression-free and overall survival in patients with stage IV NSCLC who received antibodies that block programmed death-1 (PD-1). Esteller’s group first established an epigenomic profile based on a microarray DNA methylation signature (EPIMMUNE) in tumor samples from patients treated with different PD-1–targeted antibodies. Next, the EPIMMUNE signature was validated in an independent set of patients. Then, we identified the best single DNA methylation marker that could predict response to PD-1 blockade therapy in patients with NSCLC. The top gene candidate was the T cell-related forkhead box P1 (FOXP1) transcription factor, which the investigators validated by a single-methylation assay in another cohort of patients. It was interesting to see that those EPIMMUNE-positive patients, the responders, presented with a high number of activated T and B lymphocytes, whereas the EPIMMUNE-negative patients, the nonresponders, showed in their tumors more cells of the myeloid lineage, macrophages and neutrophils, more fibrosis and immature blood vessels. The described research also represents a starting point for other studies, such as investigations into whether the DNA methylation markers examined by his team could be new targets for epigenetic drugs, or if the the identified epigenomic signature can be applied to other tumor types where immunotherapy treatments are starting to be used. 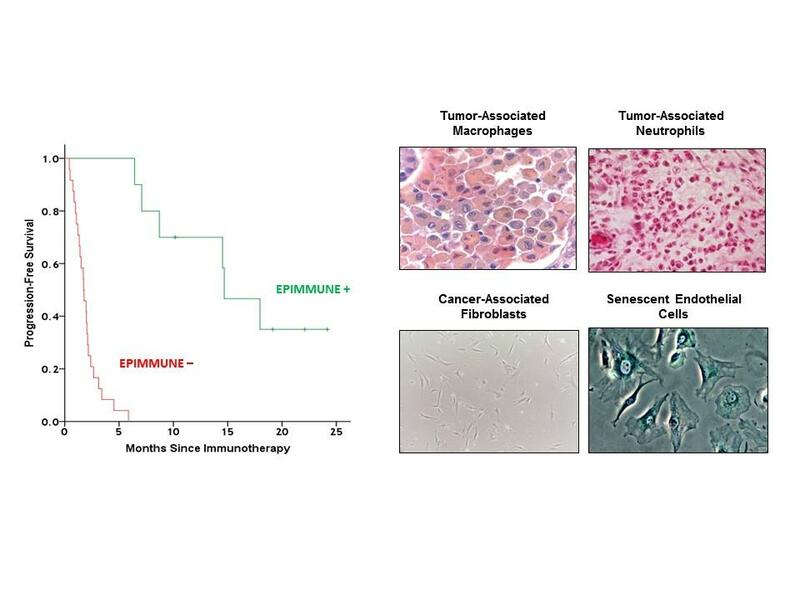 EPIMMUNE positive lung cancer patients show improved clinical outcome (left) and less immunosupressive cellular types (right). Duruisseaux M, Martínez-Cardús A,Calleja-Cervantes ME, Moran S, Castro de Moura M, Davalos V, Piñeyro D, Sanchez-Cespedes M, Girard N, BreveM, Giroux-Leprieur E, Dumenil C, Pradotto M, Bironzo P, Capelleto E, Novello S, Cortot A, Copin MC,..., Moran T, Perez L, Ramos I, Xiao Q, Fernandez AF, Fraga MF, Gut M, Gut I, Teixidó C, Vilariño N, Prat A, Reguart N, Benito A, Garrido P, Barragan I, Emile JF, Rosell R, Brambilla E & Esteller M 2018, 'Epigenetic prediction of response to anti-PD-1 treatment in non-small-cell lung cancer: a multicenter, retrospective analysis', The Lancet Respiratory Medicine, 6, 10, 771-781. Cancer genomics has highlighted the prevalence of sequence variants of unknown significance. In our publication we hypothesized that a fraction of these mutations may reflect RNA-related selection processes, thereby impacting RNA metabolism and contributing to oncogenic processes. Analyzing whole genome sequencing data from multiple cancers we uncovered frequent mutations in binding sites for RNA binding proteins and splicing regulators. Furthermore, using RNA sequencing from the same samples validated a change in RNA processing in association to these mutations. We described new alterations in cancer that impact RNA processing and proposed a systematic method for the interpretation of noncoding variants in cancer genomes. In this article we studied the recurrence of cancer mutations on potential RNA-binding protein (RBP) binding sites using whole genome sequencing data from 14 different tumor types. Our study defined new alterations in non-coding regions that impact RNA processing and proposes a systematic method for aiding the interpretation of noncoding variants in cancer genomes. 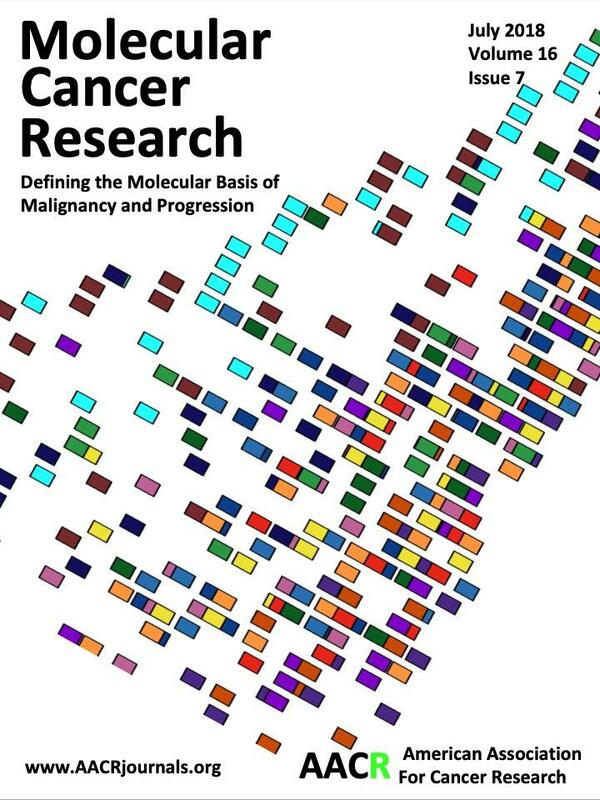 The cover image is based on the representation of the proportion of patient samples that show a mutated RBP binding site in each of the tumor types analyzed, coded in different colors. Colorectal tumors (cyan) and melanoma (brown) are the cancer types with the highest proportion of mutated RBP motifs. Singh B, Trincado JL, Tatlow PJ, Piccolo SR & Eyras E 2018, 'Genome Sequencing and RNA-Motif Analysis Reveal Novel Damaging Noncoding Mutations in Human Tumors', Molecular Cancer Research, 16(7):1112-1124. .
Feaured in the journal highlights and in the cover of July issue.